I have downloaded all of the RotN games and would like to play them in order as they appear on the games page. I downloaded them all and tested them, and have come up with a list of all games that don't function or are missing or that require special setups to use in modern OS (Windows 10, 64 bit.) I thought it might be useful to see which games are not working and if anyone has fixes for them or can locate the missing files. This fix is for if you have a game such as the one I had in Game 29- Invasion of the Space Aliens, where certain dialogue was appearing blank and causing game freezes. Might work for other issues too, but that particular one had me stumped because it was ONLY affecting my 2 gaming laptops and worked for everyone else. Right click the game executable, details, version, and look at the version. This is the version of the DOS engine you'll need. Get a working engine with that version or maybe the version above if that doesn't work from AGS archives or AGS Wiki, copy over acdos.exe to the game folder. replacing gamename.exe with the name of the executable and it should then run. It means that your folder/path name is too long, shorten it and it should solve your problem. Then the dll that it came with, Gif89.dll, I couldn't manage to register. The links to Game 39 (ROTN Quiz 2) & Game 54 (Retaliation) have been fixed. Thanks for taking the time to go through & make this list. Updated those 2 games with the list. Game 10 - Nightwatch: using dosbox the game does start up but it only shows a black screen. Game 63 - Zombie Hill: won't start up. I am getting a new laptop in 3 days in which case I'll have to re-test these. Invasion of the Space Aliens is weird because if I try to change the settings with winsetup, even if I don't change any values causes crashes and the default settings result in an empty dialogue/game freeze when I talk to anyone in Scid's. I solved the error that only seemed to be affecting me, I put in the solution in case it happens to anyone else. Now there are just 2 games left that I can't run (besides the RON quiz that isn't so important), but again for some reason the dialogue in that game seems to only be affecting me. I think I can fix that Nightwatch's crash at the start of the game. 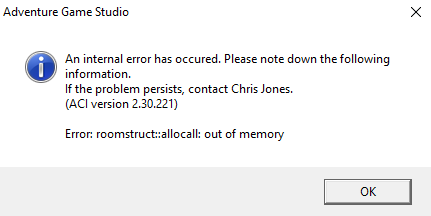 It's just a simple bug in script code resulting in game memory corruption. It should then be runnable in DOSBOX at least (since it was compiled with the DOS AGS engine). And let them fix the thing instead? The guy's email from 2001 in the readme is no longer valid. I found another game that guy made and he was using a guest account on the forums. I think contacting him will be impossible. I'd say if you can fix it then feel free, it can only be a good thing. I finally got the game running by using PCem with windows 98, I needed help to set that up, and I had to play it using a laggy keyboard for mouse, which is a problem specific to my computer. Perfect, thank you! I already played it but without sound and using bad keyboard controls. I might see if Renegade Implementer can update the database. If you can contact an original game author then it never hurts to get in touch with them, although given the amount of time that's passed it's not always possible to establish contact. Also, there's no guarantee that the game files have been kept for a recompile. As for Scorpiorus' fix for Nightwatch- I've checked it out and the game keeps crashing back to dosbox every time I try to go south from the hospital exterior screen with an error message. If someone else could check this out and see if the game crashes in the same place that would be helpful to know. It doesn't crash for me there. As far as maintaining contact, unless you guys have some sort of contact info I'm not aware of, I don't think it will be possible unless they stumble on this thread. As it seems it works I've put the dosbox version of Nightwatch up on the site. Not sure why it's crashing on me but if it works for others that fine. Ah yeah, it seems like using DOSBOX may not always work out of the box :p to run AGS games compiled for DOS operating system. The thing is, the DOS version of the AGS Engine was pretty harsh on DOS PC hardware specs, where it could easily require 16 Mbytes of system RAM or even more (especially for 15/16-bit "Hi-Color" games). The AGS' DOS engine uses a so-called DOS extender (in the case of AGS it's "CWSDPMI.EXE") to have more memory addresses available to use. However, having more memory addresses accessible doesn't always mean that PC had, in fact, so much memory. For that reason, a DOS extender can use a well-known method of unloading portions of RAM data to hard drive to free up system memory, using a swap file for this. By default, the "CWSDPMI.EXE" DOS extender tries to create its swap file "CWSDPMI.SWP" in the root directory of DOS drive. In DOSBOX this is the folder which you mount with DOSBOX' "mount" command (eg: "mount C F:\DOSGAMES"). If for some reason you have a mounted folder with restricted write-access by Windows (eg: "mount C C:\" or anything else with normally denied write-access), the DOS extender won't be able to create "CWSDPMI.SWP" file there, but it won't crash immediately. Instead, it will continue running the program up to the moment where it requires more memory than available to extender. At this point, as there is no swap file available, the program terminates with appropriate (or not so) error message. For DOS-compiled AGS games I would recommend setting up more "hardware" RAM in DOSBOX config file. For DOSBOX 0.74 it's in "file dosbox-0.74.conf" >> section [dosbox] >> parameter "memsize". By default, it's something like 16 MBytes. I'd set it to 31 as a recommended maximum for DOS programs. A practical maximum would be 63 Mbytes (as DOSBOX suggests), but some DOS games (not necessary AGS games) may kinda get confused by having so much memory available and may not work well, if at all. Raising DOSBOX' "memsize" can potentially speed up AGS games running there, since then they'd use a swap file less frequently. Otherwise, DOSBOX has to fully emulate swap-file access which can be really slow. For instance, with ridiculously low "memsize" values (1-4 Mbytes) but with a swap file still available, an AGS game can take up to several minutes to actually show you its first screen. Another thing to conserve DOSBOX "virtual hardware" memory would be running AGS games at their native resolutions and don't try to scale it up in the game setup program. Because running at 960x600 instead of native 320x200 would actually use 9 times more memory. Instead, use DOSBOX' "dosbox-0.74.conf" >> [render] >> scaler parameter, setting it as scaler=normal2x or scaler=normal3x, for example, if you want to have a larger game window. Still, for AGS games running in DOSBOX, make sure your DOSBOX environment's root directory has a full read/write access, so that AGS games would work properly, swapping their data back and forth as they want. By the way, you can drag and drop your DOS game's EXE icon over the DOSBOX icon, to start the game. In this case your game folder will become DOSBOX's root directory (EDIT: unless some other folder has already been mounted via DOSBOX config). And you should normally have read/write access to your game folder. If not, an AGS game will crash immediately, because it won't be able to write a "restart point" save game (aka "agssave.999"). Added a fix for game 29 that only seemed to be affecting me. Thanks to Scorpiorus for helping me get the game working, and scotch for helping locate the old DOS engines.